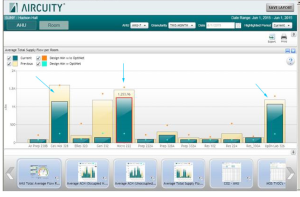 Aircuity helps to reduce energy, create a healthier environment and reduce deferred maintenance. The State University of New York at Plattsburgh is a four-year institution located in northern New York and is a part of the State University of New York (SUNY) system. Currently a big focus of all SUNY locations and SUNY System Administration is to meet Build Smart NY’s executive Order 88. The Governor’s Order mandates a 20 percent improvement in the energy efficiency performance of State government buildings by April 2020. Lab buildings are typically the most energy intensive spaces on campus and the university needed a way to address the energy use in these spaces, while still maintaining a healthy facility for occupants. Hudson Hall on the SUNY Plattsburgh campus is one of two main science buildings. Local Aircuity representative, Green Building Partners, identi­fied Hudson Hall as a great application for the solution and it was installed in all lab areas of the building. With Aircuity’s implementation, air change rates were reduced from 6 (with a few spaces at 7) to a baseline of 3 and 4 ACH, increas­ing when additional fresh air is needed. BENEFITS BEYOND ENERGY SAVINGS Once installed the university was able to realize additional benefits beyond the significant energy savings. Optimizing ventilation through Aircuity also addressed an issue with moisture in the labs. Originally the chillers in the building were not keeping up with the cooling requirements, which in turn was causing a moisture issue with the mi­croscopes. With the ventilation rates matching the current needs of the space and generally less air to cool, SUNY Plattsburgh’s EH&S department confirmed that the problem was eliminated. Aircuity’s solution also helped to reduce the uni­versity’s deferred maintenance backlog by identify­ing several faulty controllers in the building. After the installation was complete Aircuity Advisor™ Services identified several rooms where CFMs were still not reporting as low as initially targeted. By tracking the CFM levels in each of these rooms through Aircuity Advisor Services, three broken actuators were discovered and then repaired. Now these rooms are hitting their targets. Two additional rooms are being tracked to further reduce CFM levels by carefully monitoring the fume hood sash positions. The energy reduction in Hudson Hall grabbed the attention of the New York State Energy Manager (NYEM), who took note of the reduction in the building at the meter level. Currently the building is being considered for an energy efficiency award. The installation of Aircuity in the lab areas is just one example of the significant role an airside solution can play in helping to achieve important energy goals. SUNY Plattsburgh was able to save energy in one of its most energy intensive and criti­cal safety environments on campus, while receiving better indoor environmental quality and reducing deferred maintenance along the way. SUNY Plattsburgh (www.plattsburgh.edu) was founded in 1889 as a teaching college and in 1948 became an original member of the State University of New York (SUNY). Under President John Ettling, the four-year comprehensive college now serves 5,500 undergraduates and 500 graduate students. It offers more than 60 majors and a wide range of special programs that prepare graduates for professional life and advanced studies through a strong foundation in liberal arts and an experience that celebrates excellence, ethical values, lifelong learning and responsible citizenship in a global community. Situated near Lake Champlain, the Adirondacks, and Canada, the college’s unique location provides rich recreational, cultural and educational opportunities. Today, SUNY Platts­burgh is a thriving campus that has experienced significant growth in student applications, has been recognized two years in a row by Kiplinger’s Personal Finance magazine as one of the “Top 100 Values in Public Colleges,” for its mix of academic quality, financial aid, opportunities and total cost. ABOUT AIRCUITY Aircuity is the smart airside efficiency company providing building owners with sustained energy savings through its intelligent measurement solu­tions. By combining real-time sensing and continuous analysis of indoor environments, the company has helped commercial, institutional and lab building owners lower operating costs, improve safety and become more energy efficient. Founded in 2000 and headquartered in Newton, MA, Aircuity’s solutions have benefitted organizations such as the University of Pennsylvania, Eli Lilly, Masdar City, the Bank of America Tower and the University of California-Irvine. For additional information on this case study and how you could save your facility please contact us.